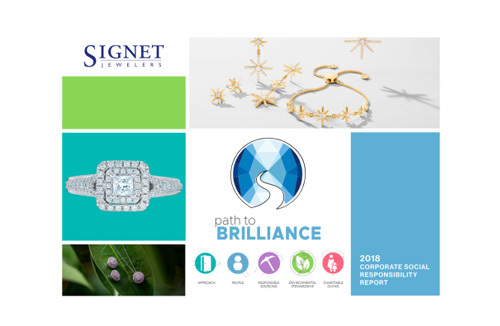 Signet Jewelers Limited recently released its 2018 Corporate Social Responsibility (CSR) report that highlights the Company’s global CSR initiatives. The Company had set itself CSR goals across four key areas: People, Responsible Sourcing, Environmental Stewardship and Charitable Giving. The recently released report provides an update of Signet’s progress toward these goals, apart from other important information. “For the first time, the company produced an integrated CSR report with its annual report, streamlining the way Signet communicates with stakeholders and investors,” the Company remarked. Signet reiterated its commitment to leading in CSR in an “authentic and sustainable way”. For example, the Company explained, Signet is one of very few public companies to have a Board-level CSR Committee, which has been in place for five years. The Committee provides strategic direction and governance oversight on goals and progress for Signet’s four CSR key areas. Signet was the only jewellery retailer selected for the 2019 Bloomberg Gender Equality Index. Over 11,000 Signet team members certified as experts in diamontology or gemmology. Signet is the first retailer to join De Beers’ innovative new blockchain programme, Tracr. The programme aims to establish a unique and completely secure way to trace diamonds. In 2018, Signet collectively raised nearly $6 million in 2018 for its national and international charitable giving partners. Since 1999, Signet customers and team members have raised more than $71 million to support the lifesaving mission of St. Jude Children’s Research Hospital®.